We thought we’d make the most of the sunny day and popped over to Attingham Park at lunch time. Half the world had the same idea and the place was alive with happy families and happy dogs roving over the parkland. There were fallow deer to see, bluebell woods, trees burstingly green, stream banks golden with marsh marigolds, and in the walled garden’s frame-yard these very shouty tulips. My goodness but they had a lot to say for themselves. Posted on April 22, 2017 April 22, 2017 by Tish Farrell	This entry was posted in Gardens, photography and tagged Attingham Park, National Trust, Six Word Saturday, Tish Farrell Writer, tulips. Bookmark the permalink. There seem to be a lot around this year. I can’t say I’d noticed them before, but I think they’re more like the wild originals. Is this a special kind or do they always do this when you get a lot of sun? I only remember the red and yellow ones and I don’t recall them ever doing this. Sounds like a really nice place to visit. They seem to be more prone to opening like this as they get older, but they definitely respond to the sun. And the pointy petals must be a new variety. I hadn’t seen white ones like this before. Shouty tulips says it all! They were yelling through those megaphones so loudly I just heard them now! Ooh, now I am wondering if I should buy some white ones for next year! Mine have been shouting loudly too, in fact I think they have worn themselves out this month! Makes you wonder what is going to be in flower in the latter stages of the year as all the spring flowers are pretty much finished now and it is not even May! Even the lilac is well out in places now, and the woods full of bluebells. So as you say – there will be a big gap. Unless of course the dandelions take over. I found a field full at Attingham. They were so inviting I had to snap them. 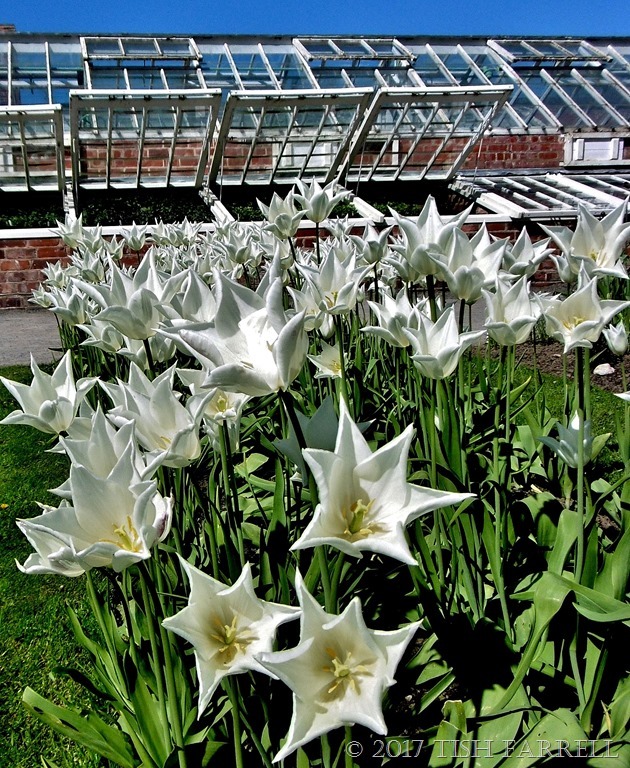 But as you say too – white tulips definitely have a lot going for them -especially today with the sun shining through them. I have a lawn full of daisies and some dandelions which have already managed to seed! Spent a lot of today weeding the gravel parking space and cleaning the patio. Hopefully there will come a time when I can actually sit outside with a nice glass of Sav Blanc and a book and just relax! Weeds, or should I more properly say plants in the wrong place, are having a field day this spring. I think our bit of lawn in the back garden is going to have to go. It’s currently moss, dandelions and even a bit of ragwort’s sneaked in. Never seen before such kind of tulips…. Love the way you captured the flowers! The wide open tulips made me think of hungry birds. A great photo. Cheers, Otto. You’re right. They do look like hungry nestlings. The last of the season’s snow is just about to disappear here. Maybe something’ll bloom soon…. The varieties are utterly astonishing. I think we’re having a new kind of tulip mania. A lovely sort. I love burstingly green trees and shouty tulips, Tish! Seems we’re all on a bit of a theme this week. 🙂 🙂 Happy sunny Sunday! Making hay before the icy blasts that have been promised us next week. Happy Sunday to you too. Enjoy the sun if you have some. We do… or do I mean did? 🙂 Planting a few bits from the Harrogate show and tidying this morning. Got a bit of planting to do too – found some nice NT plants at Attingham. One always does find a nice NT plant. I think those tulips are out to mesmerise us – shoot, shoot they say, while we look our best. Not hot on horticulture – a nice phrase Robin. I shall apply it to he who is also a plant pathologist and lives in my house. Usually I’m a bit rude and say he’s rubbish at gardening. I suspect this is because he’s only really interested in dead or dying plants.